I came across an interesting USCIS study about user satisfaction with their web pages. From the chart below, you can tell that approximately 60% of visitors think the USCIS Contact Us page is “not useful.” Only 27 percent believe the page is helping them. This is not surprising given the fact that it practically has one phone number and nothing else. Although the phone number, which connects to USCIS general customer service, is useful for some very basic questions, it is not sufficient for slightly more complicated issues that many immigrants are facing. This is where we excel. Not affiliated with USCIS, we are able to gather much more contact information and store them in one convenient location. Moreover, we can provide honest opinions on the usefulness of each contact method. We don’t yet have a survey, but I hope our user satisfaction rate is more than 27 percent. If a person is trying to contact USCIS, and is not satisfied with their contact us page, they will likely turn to search engines. We are happy that our “Contact USCIS” page has been ranked very high by search engines. 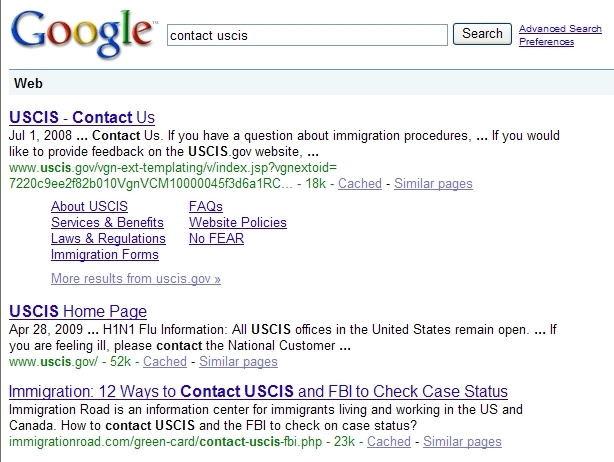 For example, if you search “contact USCIS” on Google, we are No. 3, just below the Contact Us page and USCIS home page. Yahoo and MSN put us in the same spot as well. For this reason many visitors reach immigrationroad.com after searching for USCIS contact information on the internet. We will probably never surpass those two pages, as they are considered “authority” by search engines – rightly so. 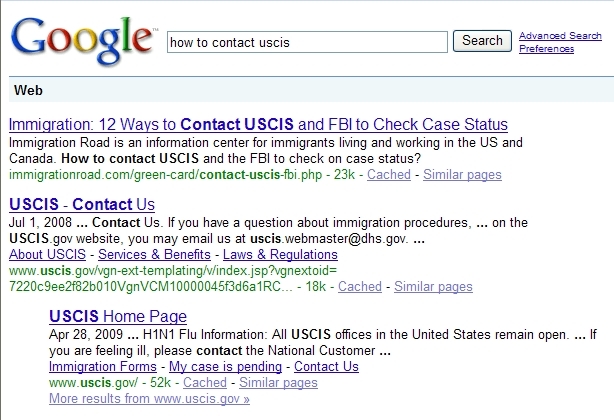 But if you search “how to contact USCIS,” we do come up No.1 on Google and Yahoo. Not many people type long keywords so we know this one doesn’t count, but we are still proud of the recognition, not just from search engines but also the overall immigration community, of the hard work we put up in creating a useful page that users are happy with.